Please be on time, thank you. “This space belongs to everyone. Keep out of it.” Aleix Vidal Cuadras, politician. It seems that we are living in a time of tension in our cities. Cracks are appearing in our way of life; angry crowds are on the streets demanding the implementation of the laws that guarantee housing for everyone; uncontrolled exchange of information is taking place on the internet; citizens are using the city as if it were their own and singing songs as if they owned the rights to them. People are losing respect for pro p e r t y. This interactive performanceconference offers to crisis-struck governments, political parties and the powers that be, solutions to pacify their citizens’ discontent, to clear up all misunderstandings and to stop citizens taking their rights into their own hands. 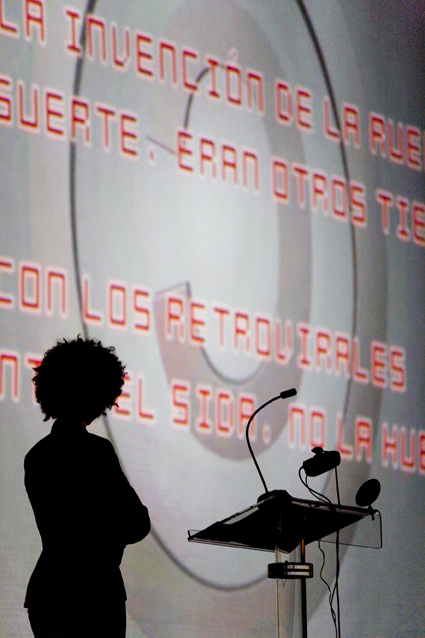 A copyleft set-piece for performers, motion graphics, tactical videos, audiences and telematic systems for democratic participation. The first show that is so open source, you can take it home with you.